The AMS TCX Package for the Mitsubishi Evolution X is the ultimate turn-key solution for those seeking unmatched power and performance for the street or drag strip. As the successor to the AMS 900X Package, the TCX utilizes our latest, even more efficient turbo technology along with a host of other significant improvements that we've made to the EVO X platform over the past 2 years. 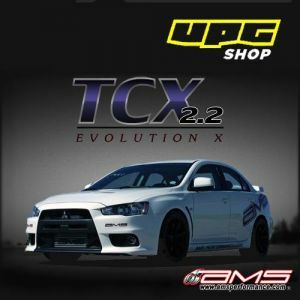 This exclusive package is capable of tripling the power output of your stock Mitsubishi Lancer Evolution X - turning it into a 850+HP street-driven super car placing the AMS TCX Package in a league of its own! At the heart of the AMS TCX Package is the AMS 2.2L Big Bore Short Block and the new AMS 900XP EVO X Turbo Kit. Over the last few years, the added displacement of the 2.2 liter engine had proven to substantially lower spool time of our original 900X turbocharger; so quick, we've used this setup as our winning combination for road racing (even prior to the development of the TDX package). By replacing the 900X with our new 900XP turbocharger, the new TCX now offers even more horsepower to fire off 10 second passes at the drag strip and more low-end torque to corner exit with the best of them. 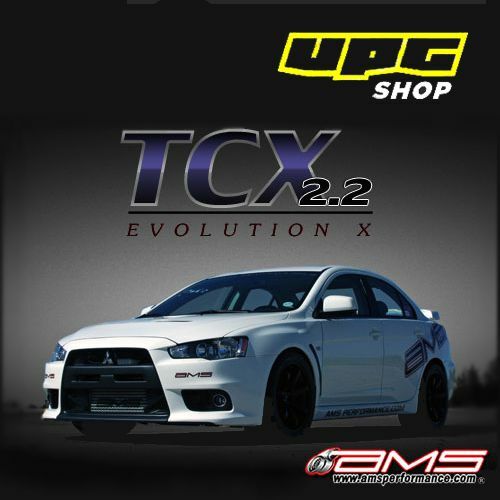 In terms of application, the AMS TCX Package is simply a great all-around performance package for any EVO X enthusiast who plans to focus mostly on Drag Racing. The AMS TCX Package utilizes our 2.2 liter Big-Bore block which adds displacement by increasing bore and not stroke. In doing so, we were able to increase horsepower without reducing RPM limit. In fact, the result is a broader power-band that is fully equipped to rev up to 9500 RPM! That’s 2000 rpm over stock! Additionally, you can expect a 10% increase in torque and a 400-500 rpm reduction in spool-up time over its 2.0L counterpart. With 850+ HP and almost 500ft-lbs. of torque, this is the ultimate combination to transform your EVO X into a domestic V-8 slayer at the strip and on the street! At AMS we are constantly improving our turbo's in search of the ultimate balance of power and response for your car. The new AMS 900XP EVO X Turbo uses a freshly revised wheel design featuring a slightly larger turbine for even more top-end power without sacrificing spool-up or response! You still get the unrivaled response of our old 900X down low, with the added benefit of increased horsepower throughout the power-band. The AMS TCX Package offers the same race-proven components found at the core of our Championship winning Time Attack EVO X. You can be sure it will provide unparalleled results and reliability for your street car. Unlike the competition, it offers performance backed by a true AMS racing heritage; and it does it all with very little compromise in smooth, day-to-day driveability. The ultimate turn-key solution for unmatched power and performance!